5 Beautiful Bedrooms on a Budget! Budget decorating ideas for bedrooms. Beautiful bedrooms on a budget. I think the Bedroom is really the most important room in the house. It’s the most important room to keep clean and tidy because it is your daily vacation spot, right? It should be a luxurious retreat where you can go and shut the door, get away from the crazies that plague you and relax and recover. 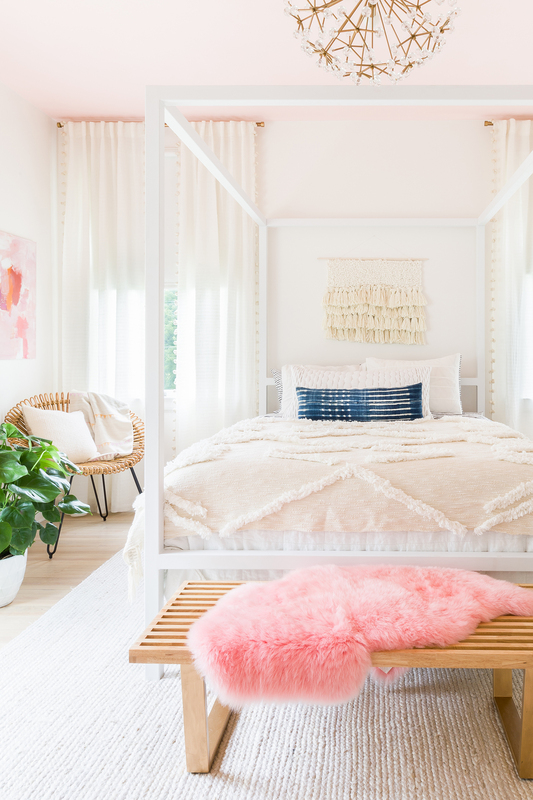 Honestly, it doesn’t take a tonna dollahs to make your bedroom a refreshing retreat. When we were thinking about selling our house, we did some major clean up and rearranging in our bedroom and it made a ginormous difference. I’ll try to get my rear in gear and take some photos of it for you and share it next week. It’s very simple. And I like it like that. So today I want to share 5 beautiful bedrooms on a budget. At least, bedrooms that I think can be easily done on a budget by DIYing them and shopping at Target or some other discount store. I love this blue/grey bedroom from Alice and Lois. It’s just so relaxing and refreshing! 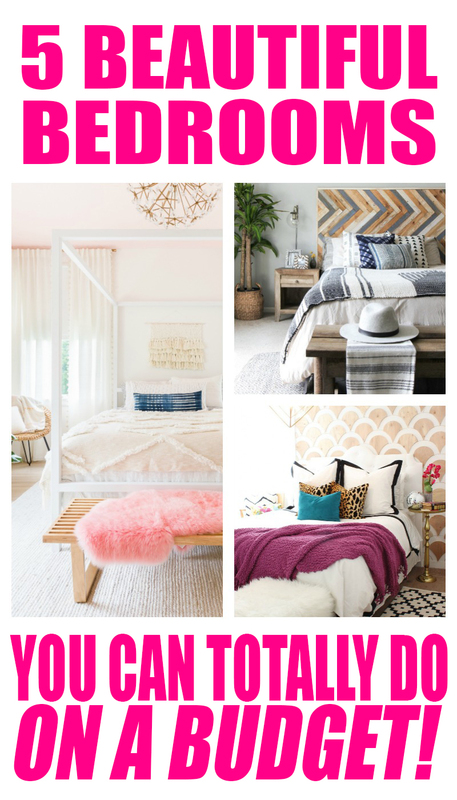 There are so many things you could DIY here… from the pendant to the footstools and the bottom of the bed. You could even DIY the headboard and find end tables from a thrift store and paint them navy blue. Use some rub ‘n buff on the hardware and they’ll shine like the golden sun. Love that pendant but don’t want to DIY it? This one from Amazon would be great! If you’re looking for something a little more vibrant, how about this bright pin and yellow bedroom from Oh Joy! It works because the yellow is tempered by all of the white and then accented by the peachy pinks with a pop here and there of bright hot pink. And the headboard is just a sideboard. I’m sure you could get something like that from IKEA. As well as the small bookcase beside it. And that little gold side table? Awesome. If you didn’t want to DIY that, you could splurge a bit and grab this one from Amazon. As you can tell, I must be drawn to blues and grays these days. 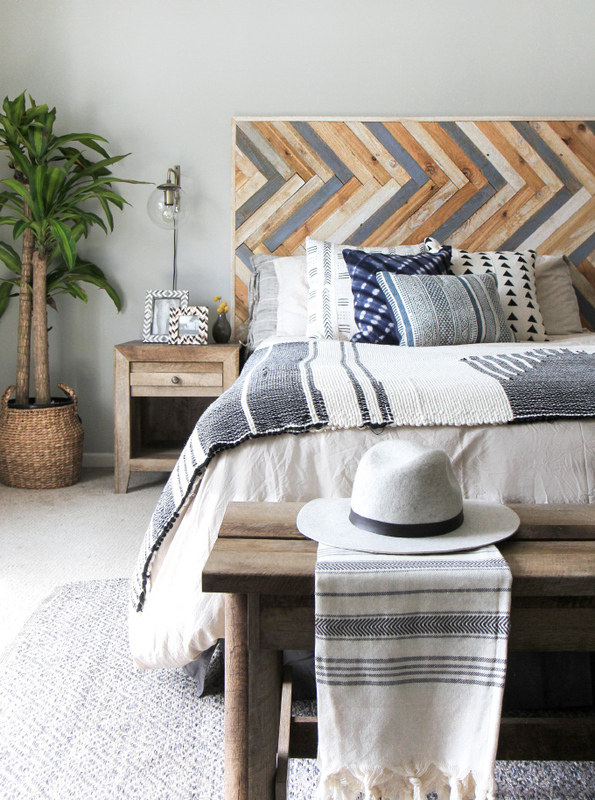 This semi-boho bedroom would have me chillin like a villain in no time. And how about THAT HEADBOARD? Isn’t it amazing? 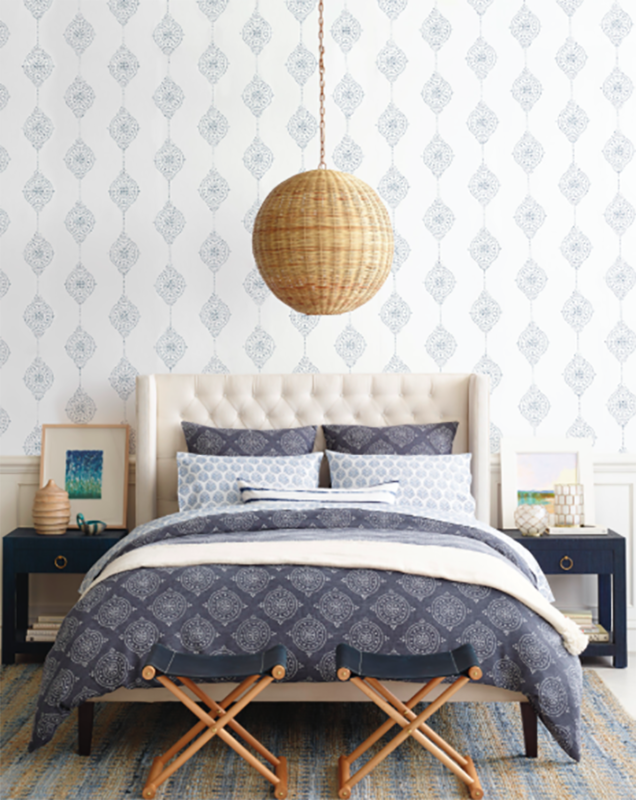 And Kelly shows you step by step how to diy that headboard here. Throw some thrifted furniture, baskets and simple woven blankets together and you have a fabulously calm and totally unique space. I might do this headboard for Brendan’s room. I have a ton of leftover wood flooring that my dad gave me and it would be perfect for this. Now were going back to some pink. If I had a little girl, man, we’d be stylin! This room from A Beautiful Mess makes me crazy. I actually saw some pink faux fur in JoAnn’s once upon a time and it would be super easy to make a faux fur throw like that one! The wall hanging above the bed and the wall art over to the left would be super easy to DIY. So LOVELY! Now, the pendant, you might have to splurge on, but what’s one costly item going to set you back. This one might work! Lastly, we have this amazing master bedroom from Classy Clutter. Give me a second while I grab a paper bag to keep from hyperventilating at it’s creativity! 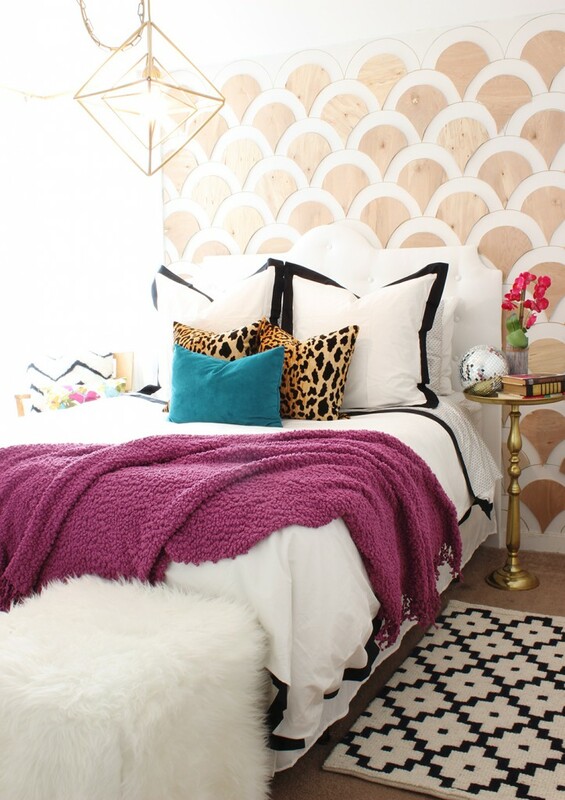 You can check out this post to see how she created that awesome accent wall! Grab some simple bedding, add a bright throw and some fuzzy cubes and you’ve got a fun, vibrant bedroom that will give you a cheery place to recuperate! I hope these 5 beautiful bedrooms on a budget give you some ideas for how to update your bedroom and get the relaxing space you deserve.